Is VisionKey activated by eye-blinks? Can VisionKey be used at different locations? What type of computers does VisionKey work with? What if a user wants basic communication only and does not have a computer? How many models of VisionKey are there and what are the differences between them? When using VisionKey with a computer, does the user have to be sitting in front of the computer? How long can a user keep VisionKey on? Does VisionKey cause fatigue or dizziness? What if a user wears glasses? Can VisionKey be used by people who wear contact lenses? Can a user choose his/her own frame? Does VisionKey have voice output? How long does it take to learn VisionKey? Can there be different Word-charts? Can VisionKey be used with different languages? Can the VisionKey system be used at different speeds? Q1. Is VisionKey activated by eye-blinks? No. VisionKey does not respond to blinks. VisionKey is controlled by eye movements. Q2. Can VisionKey be used at different locations? Yes. As VisionKey is lightweight, fully portable and packaged in a soft-sided carrying case, it can be used at home, at work, in school, at "play" and in a care facility. Q3. What type of computers does VisionKey work with? VisionKey works with both IBM compatible PCs and the Apple Macintosh family. Q4. What if a user wants basic communication only and does not have a computer? A. No problem! VisionKey works both standalone for person-to- person communication and as a computer access method for full computer control. The basic communication mode becomes especially easy when combined with VisionKey's optional voice synthesizer. Q5. How many models of VisionKey are there and what are the differences between them? 1. VisionKey 5.3 (5.3V, 5.3H) is our standard model (pictured below) and is for users with regular eye control with an option for impaired eye control included; that is users can move their eyes in horizontal, vertical and diagonal directions or in one direction only. This allows for progressive eye control deterioration (e.g. ALS). VisionKey 5+ uses direct selection or scanning. 2. VisionKey 6.3 (6.3V, 6.3H) is our scanning model and is for users who have definitive impaired eye movements and can move their eyes in one direction only (e.g. Locked-in-syndrome). We now have 2 versions of this model where users can either look up or down (6V) or left or right (6H) to make selections. VisionKey 6 uses sequential scan selection. 3. VisionKey 7.3 (pictured below) is our evaluation model and is for rehabilitation professionals and distribution partners to assess the applicability of VisionKey for a particular user. VisionKey 7 has adjustable features for assessment purposes. Q6. When using VisionKey with a computer, does the user have to be sitting in front of the computer? Q7. How long can a user keep VisionKey on? A. This is very individual; we have some users who use the system for 10-11 hours at a time. During the training period, we recommend that users gradually increase the time of use as some users experience initial sensitivity to pressure on the nose and/or eye fatigue (see Q8). Q8. Does VisionKey cause fatigue or dizziness? A. Some users experience eye fatigue initially (1- 3 times of wearing VisionKey), but this soon disappears as the eyes and the brain become accustomed to the eye movements required. Users wear the unit up to 10 hours a day with no problems. No users have reported any headaches or feelings of dizziness. Q9. What if a user wears glasses? A. No problem! H.K. 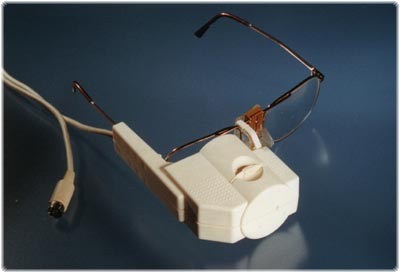 EyeCan builds the user's prescription into the VisionKey Viewer based on the information from the optometrist/optician. Q10. Can VisionKey be used by people who wear contact lenses? A. Yes. VisionKey operation is not affected by contact lenses. Q11. Can a user choose his/her own frame? A. No. The frames are provided by H.K. EyeCan as they have to meet the VisionKey Viewer precision mold criteria. Q12. Does VisionKey have voice output? A. Yes. We provide voice output as an option*. This allows users who do not have a computer to use the built-in VisionKey model. For those users with a computer and existing voice output software, VisionKey can be used to make the computer "speak." Q13. What is included in the price of VisionKey? 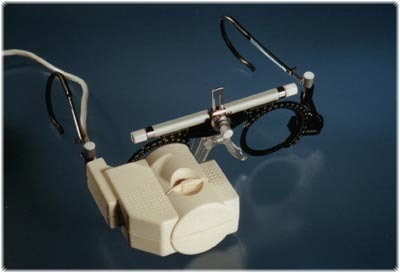 A. VisionKey 5.3 and 6.3 include the Viewer mounted on standard glasses frames, the Control Unit, 3 Charts (Word-chart, Basic ABC-chart and Advanced ABC-chart), the AC power adapter, a data cord, a battery cord, User and Caregiver/Trainer training and operational documentation/software and a custom, soft-sided carrying case. Optometrist/optician fees and shipping costs are extra. VisionKey 7.3 includes the Viewer mounted on optometrist/optician trial frames, all of the identified above and an Evaluation Model Manual. There are no optometrist/optician fees associated with this unit but the shipping cost is extra. Q14. How long does it take to learn VisionKey? A. VisionKey has graduated learning of 3 charts for user ease and operational control (Word-chart, Basic ABC-chart and Advanced ABC-chart). The Word-chart is typically learned within minutes. Proficiency with the ABC-chart may take several hours and will vary widely from one person to another. Comfortable and confident operation with a computer may take longer dependent upon the user's existing computer skills. Q15. Can there be different Word-charts? A. Yes. The company will supply customized Word-charts on a per chart cost basis. The Word-chart can also be used with a computer as a 9-position switch to control a custom software application. Q16. Can VisionKey be used with different languages? A. Yes. We presently have both French and Spanish language Word-charts and are developing others. Please contact us for additional language requirements. Q17. Can the VisionKey system be used at different speeds? A. Yes, both the user and the caregiver have the capability to increase or decrease the system speed based on the user's individual needs.